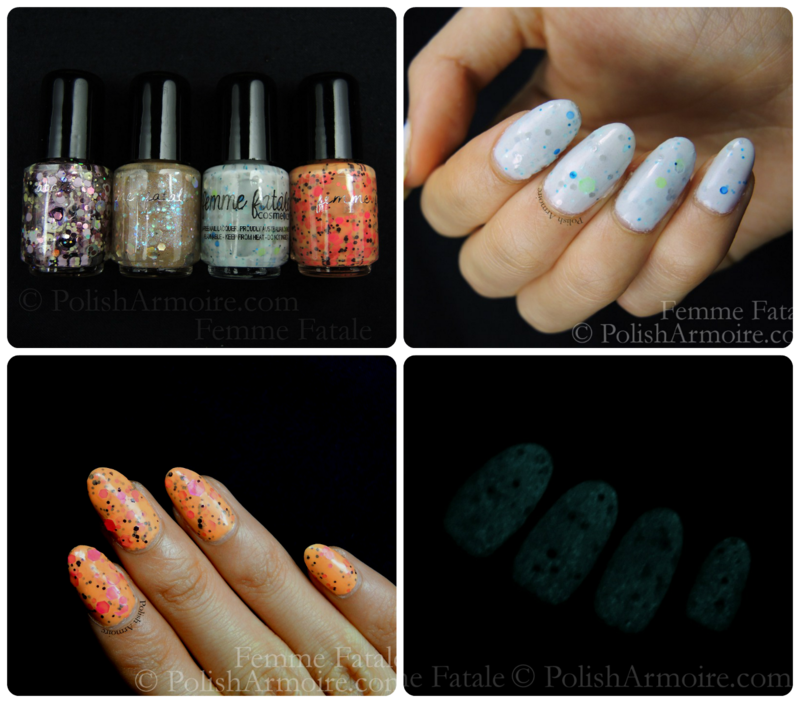 I was recently sent the below nail polish samples by Femme Fatale for review purposes. From L-R they are Cinders of Sleep, Lunar Halo, Pools of Vision and Burning Blossom. I have the latter two to show you today with the rest to appear on the blog soon. Pools of Vision is a grey-tinged off-white crelly with various sized grey, teal, white, aqua, and green hex glitter that is opaque in three coats. For some reason the colour scheme reminds me of penguins! I love the off-white base and would love to own a creme in this colour. 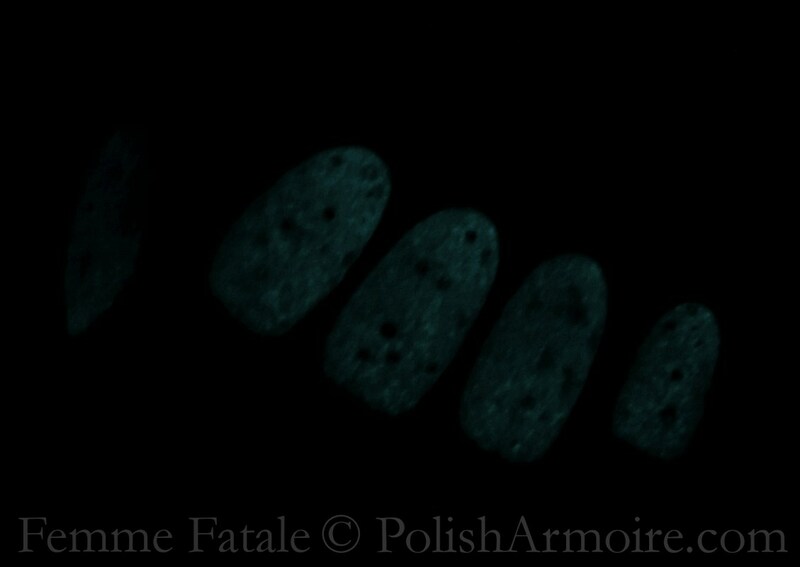 The base colour is more accurate in the above bottle shot as it is a bit too blue-toned in the below photo. Pools of Vision also glows a whitish green in the dark and I discovered this quite accidentally when I rubbed my eyes while cozily tucked in bed! Femme Fatale describes Pools of Vision as having subtle glow in the dark properties but my nails were glowing enough to reflect light onto my nearby duvet. This may possibly have been due to the fact that my daylight lamps had super charged the polish. I did test the glow in the dark properties again the next day under normal light charging conditions and the glow was still very satisfactory as can be seen below. Burning Blossom is a pale orange crelly polish with neon pink and black glitter that is opaque in three coats. The combined colour scheme of this polish causes it to pull almost neon on my skintone. It certainly has a unique colour scheme! If you like what you see, be sure to follow their Facebook page here! If you are a blogger you can apply for a Press Kit here. Tags: Crelly, glow in the dark, off-white, orange. Bookmark the permalink.